At a media event held earlier today, ZTE talked about plans for its flagship handsets, and revealed the countries where the ZTE Axon Mini will be made available. While Apple and Huawei have since released phones with Force Touch, back in July the Axon Mini was actually the first smartphone to be announced as offering the pressure-sensitive screen that can differentiate between a light, normal or heavy touch of the display. Constructed from Boeing 787 aircraft-grade aluminum-titanium alloy, the ZTE Axon Mini features a 5.2-inch Super AMOLED screen, with a 1080 x 1920 resolution, and 2.5D curved glass. Inside the device, a Snapdragon 616 SoC provides an octa-core CPU and the Adreno 405 GPU. 3GB of RAM is aboard along with 32GB of native storage. Those needing more memory can use the 128GB capacity microSD slot that is available. The 13MP rear camera uses Phase Detection Auto Focus to get your pictures ready to be snapped in just .1 second. A front-facing 8MP camera snaps selfies and handles video chats. Dual microphones provide high quality audio recording, and the 2800mAh battery keeps the lights on. A trio of biometric verification options are available: voice control, fingerprint scanning, and eye-scanning. The Axon Mini is offered in Ion Gold, Chromium Silver, and of course, Rose Gold. 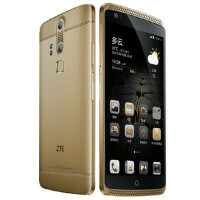 In China, the device will be available from ZTE's own MyZTE Store, and from online retailer JD.com. Other retailers will also offer the handset. After the launch in China, you will be able to find the ZTE Axon Mini in Hong Kong, Thailand, Singapore, Russia, Japan, India, Australia, France, Germany, Turkey, Spain and Italy. The pricing varies by country, but in China the Axon Mini will cost you the equivalent of $362 USD. As we told you last month, a premium version will be available featuring team logos from certain NBA franchises. That model is priced at the equivalent of $425 USD in China, and comes with special NBA content pre-installed. On October 27th, ZTE's Axon Watch will be available for purchase from the MyZTE Store. While there is no word on pricing, the timepiece features a 1.4-inch display, protected by Gorilla Glass and a sapphire coating. The wearable has a 300mAh battery, 512MB of RAM, 4GB of storage, and runs on the Tencent OS. The device offers Bluetooth 4.1 connectivity, and is IP67 certified for protection from water. The Axon Watch can be submerged to as deep as 3.3 feet for as long as 30 minutes, and emerge unscathed. The smartwatch supports the usual health and fitness monitoring, and works with messaging apps that are used in China like WeChat and QQ. So, ZTE was the first to announce it, Huawei to implement it and Apple to...um...follow and get all the credit just because it has a better application ecosystem?? One must continue to resist, instead of quitting. 'Resistance is futile' is the idiom used by the oppressive and the tyrannical. LOL. I got a bit ahead of myself but I meant to say, don't be a quitter, regardless of all the odds against you. Who implemented an array of super-acurate sensors to measure even the smallest force, into the backlight of the display itself to minimize the size and weight compromise and shipped this product to the benefit of tens of millions of people worldwide ? Btw if Apple only wanted to be first, they could have anounced 3D touch like three years ago, when they started working on it. No they couldn't and wouldn't cause they "just started working" on it. Apple Watch ring a bell? Well i hope Apple won't get another credit for iPencil, i remember how Apple fans called air view a gimmick. I admitted time I'll give them credit for better force touch implementation - by the way that better ecosystem will allow more apps developer to take advatage of having force touch. I wonder what according to them is a mini in it. The screen or the actual size of the phone? They'm wondering, how the hell is 5.2 mini smartphone screen where is the mini here ?? These manufacturers damaging the ecosystem of smartphone with all this nonsense. Maybe they mean 'mini' eyes or 'mini' brains. Better phones? Can you have HiFi sound, large battery, and f/1.8 camera for that price? Really? If it's $299 then this phone would be sweet. No, mini should be 4.5 or less. Nawww, mini should be no more than 4.7... I.E Sony Xpeira Compact. Anything over 5inches that is called a "mini" makes no dam sense anymore lol. I'll let it slide tho if its 5inch but has an awesome screen to body ratio over 70%. Another "mini" version that has dumbed down specs. F you ZTE. It's not event hat mini - 5,2 inch brick with massive bezels - competition can easily squeeze flagship components inside even smaller devices.